They say geometric prints are the “new” thing. I say they copied my mom! It’s funny how history and fashion repeats itself. But, what’s even more humorous is when designers call it “new”. The first pic is a dress by Ann Betty. I’m loving the strong, bold pattern in a sweet sheath style. The second pic is from a photo shoot on the Cult of Style blog. It’s so dramatic and really drives the geometric message home. The third pic is from Marc Jacobs 2013-2014 runway show. 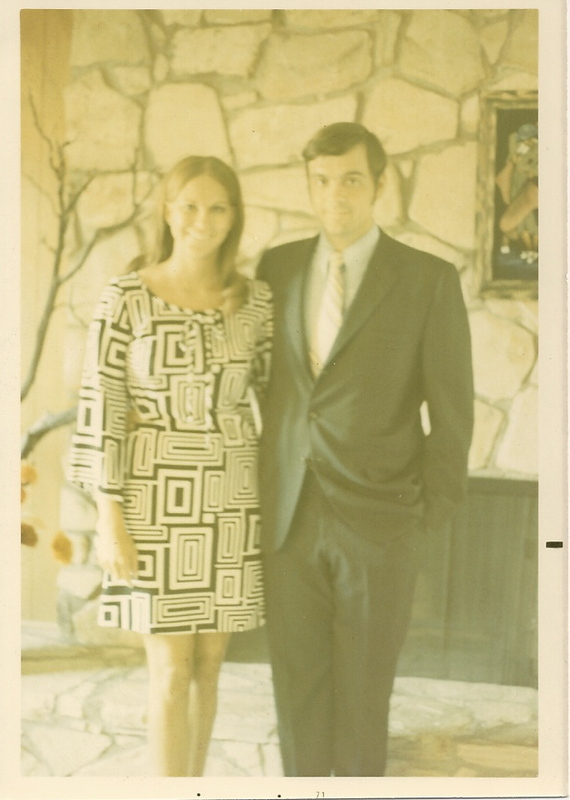 And the last pic is my mom and dad in our Anaheim house in 1971. My mom took her style seriously and I can honestly look back and say, “Now I know why I am the way I am.” I was constantly surrounded by design, I mean look at the velvet picture on the fireplace. Instead of saying geometric prints are a “new” look, I’m going to say it’s a 1971, Anaheim, California inspiration. If only my mom would’ve kept all of her clothes, I would be able to predict the trends for ever. For now, I’ll just keep digging through all of our old family pictures. Maybe I’ll find another “new” thing.